It won’t be a surprise to see the Vikings draft a tight end next week. They don’t have one under contract beyond the 2019 season. Injuries limited the Vikings at tight end last season, finishing the year with only two available for practices while working out free agents during playoff preparation just in case. Starter Kyle Rudolph has amassed 52 straight starts, but not without gutting through injury. Rudolph was admittedly limited by an ankle injury he played through at the end of last season. He underwent surgery this offseason, putting his availability for spring practices into question. Behind him, the Vikings have David Morgan, Blake Bell and Josiah Price on the depth chart. Another member or two wouldn’t hurt the group, but one NFL Draft analyst for SiriusXM believes the Vikings could make a big investment there next week. Phil Savage, a former personnel evaluator for the Eagles, Browns and Ravens, believes the Vikings are in a good part of the draft for a top tight end — if they don’t nab an offensive lineman. It won’t be a surprise to see the Vikings draft a tight end next week. They don’t have one under contract beyond the 2019 season. That’s when Rudolph’s current deal, costing about $7.6 million against the cap in 2018 and 2019, expires and Morgan’s rookie contract comes to an end. However, Rudolph is 28 years old with 16 touchdown catches in the last two seasons and one of the league’s lowest drop rates in that span; an extension may be worked out. Still, the Vikings could pair him with one of last year’s best college tight ends. 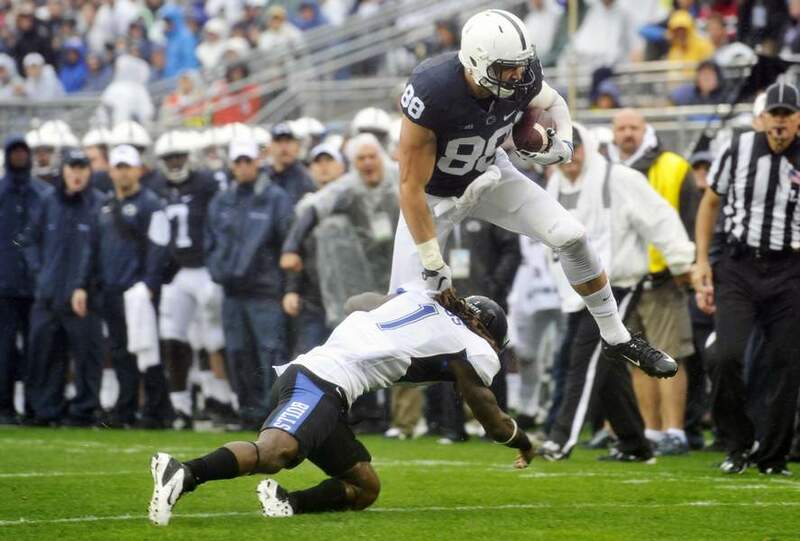 Both Goedert (6-5, 255 pounds) and Gesicki (6-5, 247 pounds) are viewed as NFL-caliber receiving tight ends who put up numbers in college. Gesicki, who caught nine touchdowns last fall for Penn State, showed off his athleticism at the combine. He led all tight ends in the 40-yard dash (4.54), vertical jump (41.5″), broad jump (129″), 3-cone drill (6.76), 20-yard shuttle (4.10) and 60-yard shuttle (11.33). His only second-place finish came in the bench press (22), one rep behind Goedert.